Built into the new G512 mechanical gaming keyboard, Logitech G’s Romer-G switches have been developed from the ground up to deliver the best possible gaming performance that is up to 25% faster than standard mechanical switches. Romer-G switches come in two options. There’s a Tactile switch that gives you distinct actuation feedback every time you press a key, and there’s the Linear version that delivers a completely smooth keystroke. But if you live for the click of a classic mechanical switch then you might have felt left out in the cold – until now. 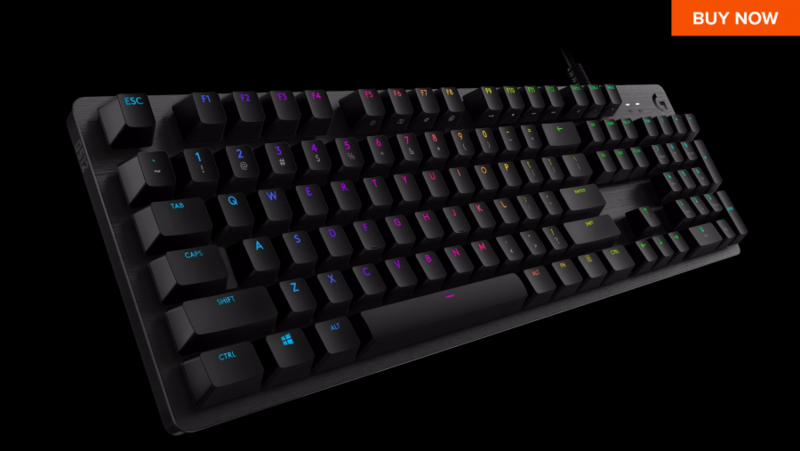 With its new G512 mechanical gaming keyboard, Logitech G finally has an option for all you click-lovers. The GX Blue is Logitech G’s brand new mechanical switch, and it brings the noise in a gloriously satisfying manner. Every keystroke responds with a click feel and sound so you know exactly when you’ve pressed a key. If you like having that satisfying audible click to your gaming keyboard, the G512 mechanical gaming keyboard is going to be your new must-have switch choice, especially when you consider that it’s subject to the same rigorous quality control as Romer-G switches. Tested to 70 million key presses, you can be sure that it won’t let you down in the heat of battle. Regardless of how you like your switches to sound and feel, you’ll find that the G512 is packed with advanced features that are guaranteed to delight even the most demanding gamer. The first thing anyone’s going to notice is the G512’s per-key RGB lighting with the full spectrum of around 16.8 million colours to play with. 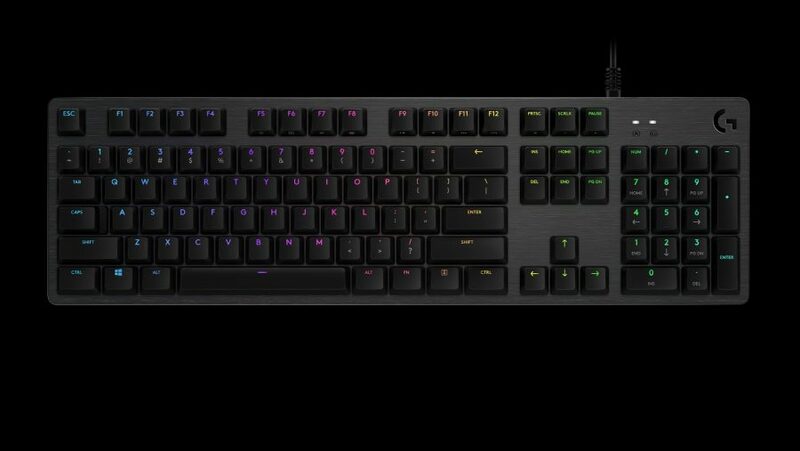 The G512 boasts full spectrum customisable per key RGB lighting that enables you to create your own RGB effects or select from a variety of preset animations and effects. 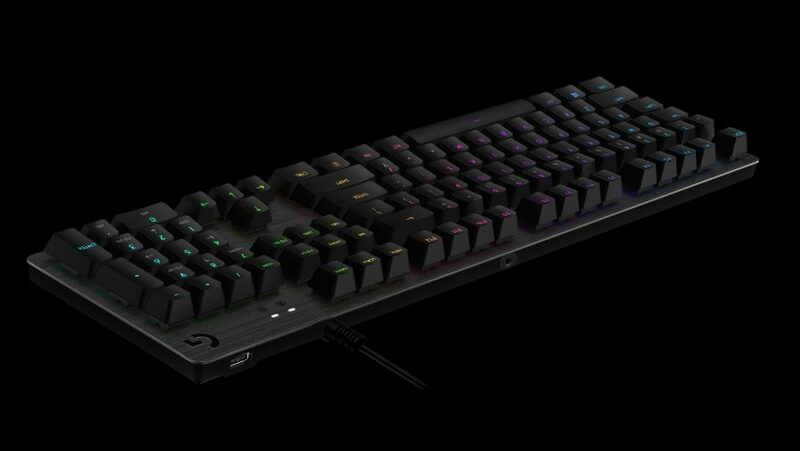 Plus, the keyboard also features Logitech G’s new Lightsync tech under the hood to bring stunning lighting effects to your games that actually synchronises with in-game action. Not only will you be able to see your keys even with the lights down, you can also be certain that the G512 won’t slide around on the desktop when things get hectic. Its additional, dedicated USB cable conveniently connects the USB passthrough port to its own input for charging and data. The keyboard also features a non-slip chassis made from an aircraft-grade aluminum alloy, so even though it’s a slimline piece of kit it feels sturdy. It also packs an essential extra in the form of a USB passthrough port that gives you 100% data speed and power throughput just where you need it, whether you want to charge your phone or plug in a wireless mouse if the batteries are getting low. With its 26-key rollover and anti-ghosting, the G512 is capable of keeping up with you no matter how frantic your keyboard action. Press all the keys you want and the G512 delivers exactly the results you’re after, and its function keys can be programmed to fire off custom macros at the touch of a button, removing any possibility of fouling up complex command sequences in the heat of the moment. The Logitech G512’s a solid piece of essential gaming equipment with all the features you need to win. At just $99, with free shipping from Logitech G included, there’s no excuse for you to be lacking in the keyboard department. Order the G512 today so that you can up your game in time for the next gaming session.